Polo color includes White, Green or Orange. T-Shirts (College, United States Military, School Spirit shirt, or School Organization shirt) any color. Click HERE for the full uniform specifications. 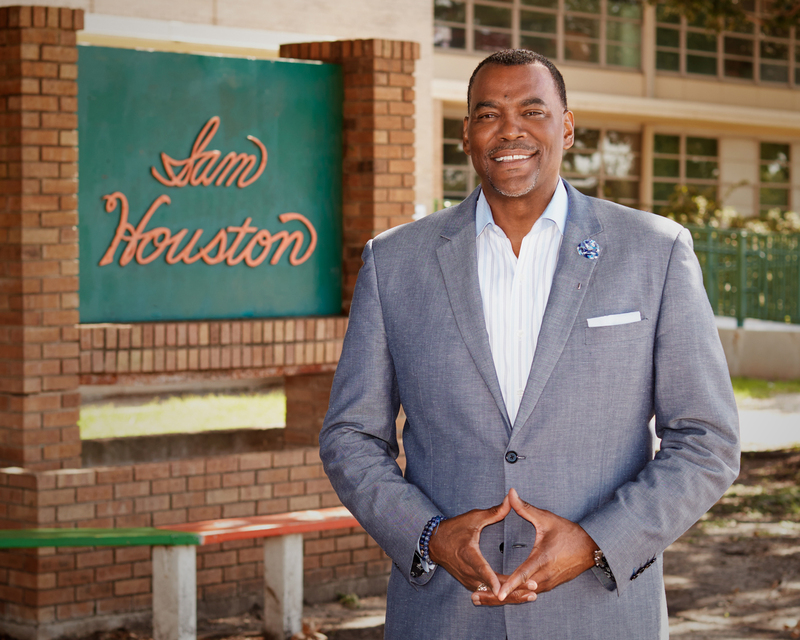 As principal of Sam Houston High School, it is my pleasure to welcome everyone back for another great year at “Sam.” We are excited to welcome students back to our hallways- filling them with energy, passion, and enthusiasm for learning. It is our mission to ensure each child is prepared for college and career success upon graduation. Another part of our mission is to ensure each child feels welcomed and connected to the Sam Houston community. Our teachers will continue to utilize Best teaching practices in the classroom that challenge and engage our students in learning. We believe all students deserve a high-quality education and we will motivate our students to pursue excellence in whatever career path they choose after high school graduation. I encourage you to stay in contact with your child’s teachers. Our teachers all have email addresses, which can be found on our website. I would also encourage you to provide the school with your email address. By providing your email address, you will receive our periodic newsletters and other vital information. If you need assistance with setting up an email account, stop by the main office, and we will be happy to assist you. We will also post our newsletters to our website under the “News” tab. To receive quick news and information, follow us on Twitter @SAISDHoustonHS, or follow me @DrDiop. I am honored to serve as Principal of Sam Houston High School. It is indeed a privilege to be part of the rich legacy and history of this magnificent school. A place where the community, teachers, and students strive to uplift one another and ensure each of us reaches our full potential. Please feel free to reach me at mdiop@saisd.net.